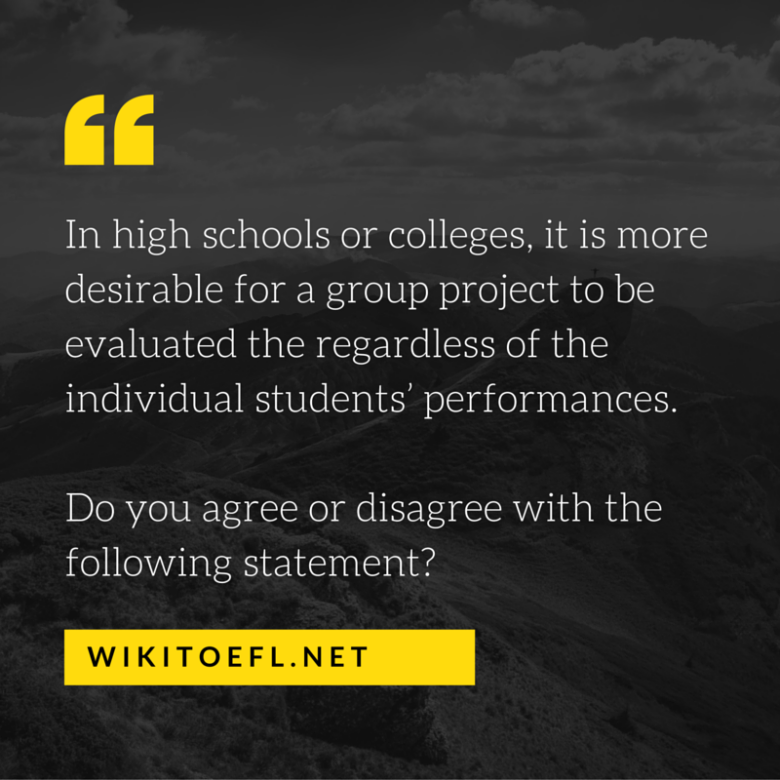 In high schools or colleges, it is more desirable for a group project to be evaluated the regardless of the individual students’ performances. School Teach for Careers or General Knowledge? One of my teachers recently gave every member of a group project the same grade. I was not pleased about this. I feel students should be evaluated based upon their individual performances even when they are doing group projects. One reason I think this way is that every member of a group project makes a different contribution. Therefore, it is logical for students to be graded based upon the work they did, not on how the other team members did. If teachers give individual grades, they can reward the hardworking students. Simultaneously, teachers can punish lazy students or ones who performed poorly. I was actually negatively affected by a teacher’s grading policy recently. We had a group project in our Korean class. We had to write several articles to make a class newspaper. In my group, only I tried hard; the other students did nothing. Because of their poor work, I too got a poor grade despite working hard. Giving a group grade in that situation was simply unfair. Also, giving individual grades can inspire more students to try. Lazy students often do nothing on their group projects since they can depend on the diligent students to do the work. But if teachers give individual grades, getting a “free ride” like this will no longer happen because even lazy students will have to do more work. I know this grading policy works because my sister’s university instructor did exactly the same thing and succeeded in getting more students actively involved in their projects. Since more members worked harder on their projects, all the groups not only finished their projects faster, but they also did better work. Teachers should definitely give students individual grades on group projects. This will reward the hardworking students and force the lazy ones to work harder. Diligent students should not be punished for the laziness of other students.